The link that brought you to this page and the page title are a bit of a misnomer, because this short report is not long enough to cover so many chapters of the Bible. What the link and the title do, however, is track where we are in our plan to read through the entire Bible in 1 year. May each report pique your interest and help you to draw near to God. The Bible, James 4:8, tells us if we do so God will draw near to us. A chart is at the end of the report and Works cited follows that. Internal links provide additional information. ​BIBLE READING—WEEK 29—PROVERBS 10-29: Last week I provided an overview of Proverbs and looked at some key words, and shifted into high gear to dig into the deeper meaning of the phrase the fear of the Lord. This week we finished reading Proverbs and that is reflected in this week’s Short Report where we review some important sayings and once again consider the fear of the Lord, a term that is repeated many times in Proverbs. This time I’ll be using a chart that shows how the term is used in 8 different versions of the Bible. With Genesis being the first book of the Bible and Revelation being the last book it is easy to see why many refer to them as bookends. But the reason goes deeper, because Genesis and Revelation share many common themes. For instance, there is a creation motif in both. Genesis 1:1 says, “In the beginning, God created the heavens and the earth,” and in Revelation 21:1 we are told, “Then I saw a new heaven and a new earth, for the first heaven and the first earth had passed away.” The tree of life is another theme common to both. In Genesis 3:24, after the Fall, the tree of life is guarded so mankind cannot access it. However, in Revelation 22:14 we are given entry to the tree of life. The term tree of life only appears in the Bible 10 times, 3 time in Genesis, 3 times in Revelation, and 4 times in the book of Proverbs. In Proverbs 11:30 we read, “The fruit of the righteous is a tree of life, and whoever captures souls is wise.” Soul winning is in the heart of all of God’s children. Jesus Himself commanded us to go into all the word “and make disciples of all nations, baptizing them in the name of the Father and of the Son and of the Holy Spirit.” In addition we are to teach these new disciples everything Jesus taught us (Matthew 28:19-20), which is recorded in His Word—the Bible. And fruit, of course, is produced by plants. Because we are spiritual branches of the True Vine, Christians bear spiritual fruit—good works—with the help of the Spirit of Truth (John 15:1-17; 14:26). By remaining in the Vine we overcome the world and are granted access to the tree of life (Revelation 2:7). Not just us, but also the souls we capture along the way. Along with good things, like the tree of life, which go hand in hand with wisdom, there are bad things which are characteristics of foolish and wicked people, and are often called abominations. Proverbs 6:16-19 declares, “There are six things that the LORD hates, seven that are an abomination to him: haughty eyes, a lying tongue, and hands that shed innocent blood, a heart that devises wicked plans, feet that make haste to run to evil, a false witness who breathes out lies, and one who sows discord among brothers. The Dictionary of Biblical Imagery tells its readers, “From the biblical perspective an abomination callously disregards and actively disdains the values God has established. It affronts God's holiness, sovereignty as Creator and purposes expressed in the Law” (Ryken, Olive Tree). The word abomination occurs 21 times in the book of Proverbs. Other abominations include the devious person, wickedness, a crooked heart, lying lips, the sacrifice of the wicked, the way of the wicked, the thoughts of the wicked, an arrogant heart, a person who justifies the wicked and who condemns the righteous, and the scoffer. In addition, a false balance, also called unequal weights and unequal measures (11:1; 20:10, 23) is mentioned three times. In one sense we can see a classic set of scales with gold dust in one side and various weights being added or subtracted to the other side to establish the correct measure or value of the gold. But that is not the only method we use to measure value. A day’s worth of work, measured hourly in today’s society, has so much value. We should record our hours accurately and be paid accordingly. A cord of wood is not weighed, but measured by length, width and height; here, too, the measure must be fair. Typically, items on the shelf in a retail stores are priced as is, and the ring-up must be true. We are quick to tell a clerk when we have been overcharged. We must be just as quick to return any overpayment. Thus we keep the scales, however they are fashioned, balanced for all concerned. To do otherwise is an abomination to the Lord. One of the last abominations is recorded in Proverbs 28:9, “If one turns away his ear from hearing the law, even his prayer is an abomination. Thus, the Word of God and prayer are interconnected. It is easy to understand that God will not listen to people that won’t listen to Him, not to be mean or spiteful, but to be just. In John 14:14 Jesus says, “If you ask me anything in my name, I will do it.” Prior to that, in verse 12, Jesus says, “Truly, truly, I say to you, whoever believes in me will also do the works that I do.” The relationship between the two teachings is clear, only those that believe in Jesus can do things in His name. In the same way, people that don’t listen to God’s Word don’t believe in Him, nor His Word, and their prayer is an abomination. It was my hope to use the following chart as a springboard to speak more on the subject of the fear of the Lord. I always have a difficult time with the summer heat, and that goes double this year. I’m thankful I was able to compile the information and hope you find it of some use in your own studies. I will say, especially in this modern age, that each generation brings its own unique point of view to Bible study. A generation ago it was normal for the average citizen to respect our government and the civil authorities. The 60’s brought a lot of civil unrest. Although it is healthy to question, to a degree, those in authority, today more people than ever challenge all forms of authority. More and more we have unholy living becoming a part of popular culture, while individuals stand up for their “rights” and tell us they will no longer submit to the values of the dominant culture. As a part of our response, today’s Christian community is quick to downplay the term fear of the Lord by explaining we are to respect God, not fear Him. I have no doubt that God could have found a more appropriate word, one that better fits our human sensitivity, if He so chose. Indeed, if humanity needed a special word to explain fear in relation to God, one that only applied to God so we would not be so easily confused, He could have wrote that word on our heart and on nature. So, we need not substitute the word fear with respect, or otherwise designate a special meaning to the word each time we read it. Is it possible for us to fear God on the one hand and for perfect love to drive out fear on the other? Yes. Just like God is in control and we have free-will to choose our own way. In both situations the terms are not mutually inclusive. The King James Study Bible has this to say, “The fear of the Lord means submission to the Lord and His revelation. When one is afraid of something he either runs from it or submits to it. The latter idea is in view here. It is a healthy fear like the fear of electricity or the fear of one’s parents, which causes one to act in an appropriate manner. [In Proverbs 1:7] the beginning does not mean that ‘the fear of the lord’ is left behind in the course of acquiring wisdom, but that it is the controlling principle of wisdom” (Brindle, 962). Of the 6 “Concordia House books” I used last week only Kuschel and Ehlke took a position on the fear of the Lord topic. Kuschel took the “stronger” stance, but neither position addressed the subject full-on . So I was thankful to find a good LCMS website that offered a well written look at the subject by author and pastor, Andrew Richard. Richard provides many thoughts on the subject and presents an authoritative view of the topic. At one point Richard says, “He [Jesus] satisfied divine fury, and therefore you can rest secure, knowing that you are no longer under wrath, but under grace. Should you still fear the Lord? Of course! His nature hasn’t changed, his Law hasn’t changed. In his mercy, he has covered your sins, but he has not given you license to sin” (steadfastlutherans). The link for this article is provided in the Works Cited section. This Short Report focused on three terms found in chapters 10-29 of Proverbs: tree of life, abomination, and fear of the Lord. 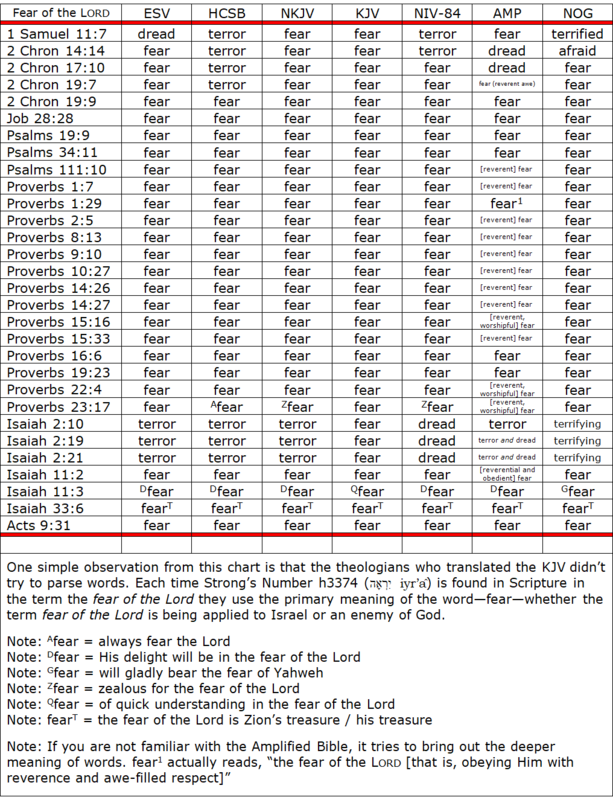 In addition, a chart is provided that compares how 8 versions of the Bible use Strong’s Number h3374 (יִרְאָה iyr’â) when the exact term fear of the lord is used. Although dread, terror, terrified, etc. are occasionally substituted in most versions. This is the second week in a row that fear of the Lord was a main focus and shows the “softer” position of fear equals respect and the “stronger” view of fear means fear and it’s OK to have a healthy fear of the Creator of the universe. Brindle, Wayne, A., et al. (Ed. ), The King James Study Bible. Liberty University, 1988. Note: Amazon and ChristianBook also carry this book. Steadfast Lutherans. The Year of the Lord. Web. 20 July 2017.